Top: reference scans and input images from four views; Bottom: our reconstructed mesh, textured mesh, and error visualization. 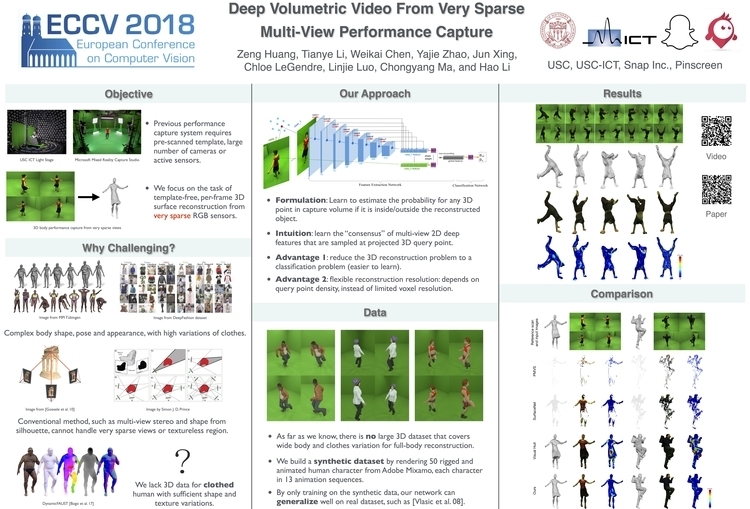 We present a deep learning based volumetric approach for performance capture using a passive and highly sparse multi-view capture system. State-of-the-art performance capture systems require either pre-scanned actors, large number of cameras or active sensors. In this work, we focus on the task of template-free, per-frame 3D surface reconstruction from as few as three RGB sensors, for which conventional visual hull or multi-view stereo methods fail to generate plausible results. We introduce a novel multi-view Convolutional Neural Network (CNN) that maps 2D images to a 3D volumetric field and we use this field to encode the probabilistic distribution of surface points of the captured subject. 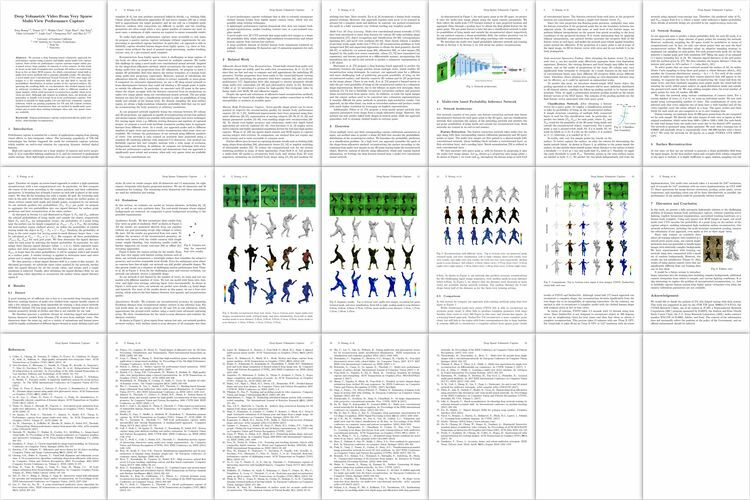 By querying the resulting field, we can instantiate the clothed human body at arbitrary resolutions. Our approach scales to different numbers of input images, which yield increased reconstruction quality when more views are used. Although only trained on synthetic data, our network can generalize to handle real footage from body performance capture. Our method is suitable for high-quality low-cost full body volumetric capture solutions, which are gaining popularity for VR and AR content creation. Experimental results demonstrate that our method is significantly more robust and accurate than existing techniques when only very sparse views are available.